A Liberal's Libretto: Julie Andrews singing "Old Man River"? Julie Andrews singing "Old Man River"? We'd like to update you on something we discussed a while back about Julie Andrews. We reported here on some widely reported rumors about the actress/singer staging a comeback as a singer - with or without vocal reconstruction. In the LA Times this week, Ms. Andrews sets the record straight: she's not making a comeback as a singer. For the last few months, it seems that Ms. Andrews has been trying to dispel rumors that she has had the vocal reconstruction surgery that we discussed earlier. For the last few months? Why is it that this is the first we're seeing of it. "Old Man River"? What a hoot! 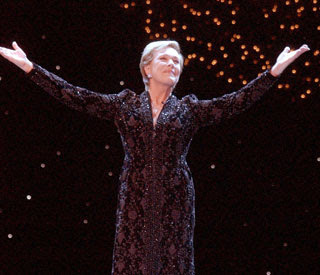 For more on Julie Andrews' concert in London, check out ticketuk.com. To read the entire LA Times article, check out their Classic Hollywood page.